Oral Anticoagulants are drugs that are used as blood thinners especially in patients to prevent clotting of the blood. These medicines are useful in patients who have undergone valve replacements and in some special cases of coronary and vascular diseases. Ø Chronic atrial fibrillation: Here, the patient has a rhythm abnormality leading to irregular beating of the atrium [collecting part of the heart] and that leads to irregular heart beating. The patients usually will develop clot in the appendage of the left atrium and in some this may get dislodged and travel along the blood stream to block the distal part of blood vessel in the heart, limb or brain. This may have disastrous complications. The anticoagulation treatment should be considered as long as the patient suffers from atrial fibrillation. Ø Coronary Surgery: Certain surgeons do administer oral anticoagulants in patients with coronary grafts. We use these drugs in patients who have undergone coronary endarterectomy as there is a large raw area which is prone to induce clotting within the blood vessel and lead to sudden obstruction, ischemia or heart attack. This treatment is usually given for 6-8weeks. In case the patient is having problem with anti-platelet drugs, there may be some logic for using the drugs. It is sometimes given in patients who have sluggish flow in the coronaries due to dilated ectatic vessels or coronary aneurysms. Ø Deep vein thrombosis: Patients who have had clotting of the deep veins of the legs or sometimes clotting of the veins of the arm (Paget Shroeder Syndrome etc) will require to take oral anticoagulants till there is resolution of the venous problem. Ø Vascular Surgery: In some patients with vascular surgery, oral anticoagulants are advised especially if there is a large raw area or there is expectation of sluggish flow. v Above an INR of 4.0, we can expect bleeding and that may occur from minor injuries or without cause such as gum bleeding, stroke or bleeding in the urine. v Below an INR of 1.5, the purpose of taking the tablets is lost as it is useless and this may give rise to disastrous problems such as valve blockage or pulmonary embolism. 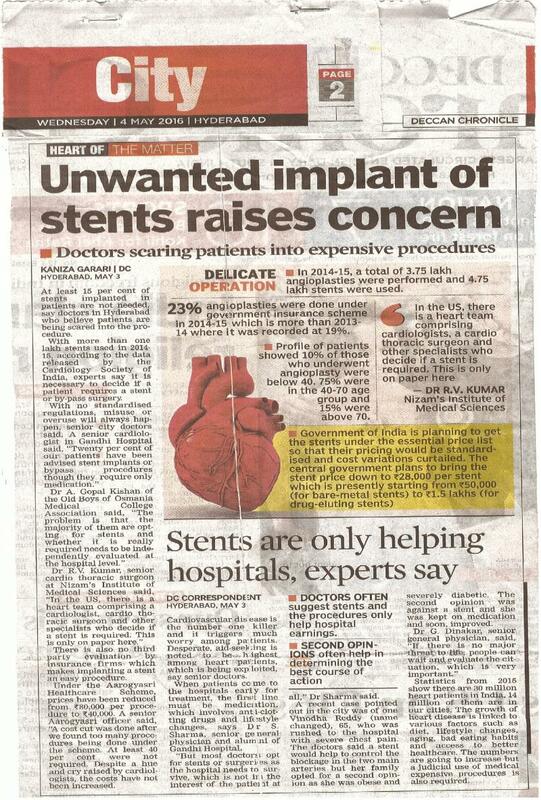 There is a tendency to put more number of stents and to "highlight" the ills of surgery. Actually, surgery and percutaneous intervention are complimentary modalities and are not competitive, which means that in some cases the stenting will be better and in some cases surgery would be better.